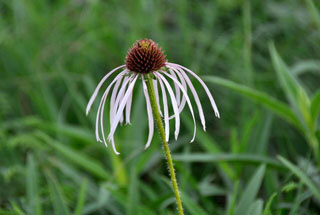 Echinacea pallida (Nutt. ) Nutt. Stems: Erect, 1 to several, simple or sometimes branched, coarsely hairy. Leaves: Alternate, simple, stalked, oblong lanceolate to linear-lanceolate, 4-12 inches long, .5 to 1.5 inch wide, taper at both ends, surfaces rough, 3-veined; margins entire; upper leaves sessile, reduced in size. Inflorescences: Heads, single, terminal, long-stalked. Flowers: Bracts lanceolate to narrowly oblong, overlapping in 3 or 4 series; ray florets pinkish purple to whitish, 1.5 to 3.5 inches long, 1/4 to 1/3 inch wide, strongly drooping; disk florets 5-lobed, about 1/3 inch long, numerous, brownish purple, interspersed among stiff, spiny-tipped, chaffy bracts; pollen grains white. Fruits: Achenes, small, 4-sided, glabrous, tipped with toothed crown, enclosing small seed. Habitat: Dry, open rocky sites. Uses: Native Americans used the leaves to treat rheumatism, mumps, and measles and the roots to treat burns and toothaches. The root was also chewed as a cold remedy and to increase saliva flow to prevent thirst. A tea made from powdered roots and leaves was drunk to treat sore gums and sore throats.